It’s absolutely critical to stop tooth decay and repair any damage to tooth structure. Hopefully, we’ve caught it early in the enamel and dentin where we’re able to repair any holes or “cavities” that might have developed by filling them. 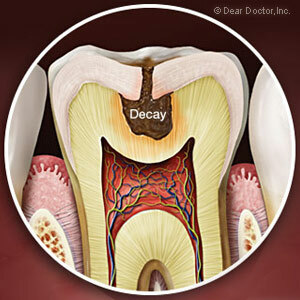 But what if the decay has crept deeper into the interior of the tooth? In this case, you’re at a much higher risk of eventually losing the tooth. If the decay has spread into the bone, a root canal treatment is usually your best option. The first sign that decay has invaded the pulp, the innermost layer of the tooth, and the root canals may be a severe toothache. It’s different from the wince of pain or discomfort caused by sensitivity to temperature or pressure. Inner decay pain is constant and often excruciating. This is because the infection is attacking the nerves bundled within the pulp chamber. The pain can last for several days, and then suddenly stop altogether. No pain is good news, right? Wrong — the pain has stopped because the infected nerves have finally died and can no longer signal the brain. The infection, though, is very much alive and will continue to advance toward the root where the damage may eventually cause you to lose the tooth. A root canal treatment removes decay in the pulp chamber and canals. We first drill an access hole to enter the pulp chamber. Once inside, we use special instruments to completely remove all tissue and disinfect the empty chamber. We then fill the chamber and root canals with a special filling and seal the access hole to prevent further decay. A few weeks later we install a custom crown to protect the tooth further. If you have a toothache, or you’ve had one that suddenly went away, you should schedule an appointment for a dental examination as soon as possible: this is the only way to accurately determine the cause of the pain. If a root canal is deemed necessary, the sooner we perform it, the less chance the infection will cause you to lose your tooth.